“It’s a tough day,” says Dwayne Joe of Cowichan Tribes. He is one of hundreds gathered outside of Our Place on Feb. 16 for the 12th annual Stolen Sisters Memorial March. As songs drift up from the drum circle in memory of the thousands of missing and murdered Indigenous women and children across Canada, Dwayne Joe says despite the difficulty of the day, this gathering of remembrance helps him be with his mother, Catherine Joe. “I get to see her anyways. Yeah, I get to see mom, hearing these songs. [The songs are] what makes me think of how it makes me happy getting to see her on this day,” Dwayne says. Dwayne holds up a large photo of his mother, who went missing in 1977 when he was just three years old. His younger sister, Sylvia Alphonse, was one year old. In Canada, Indigenous women are over three times more likely to be victims of violence than non-Indigenous women. In Canada, Indigenous women are over three times more likely to be victims of violence than non-Indigenous women. A Statistics Canada report found that 24 per cent of homicide victims in 2015 were Indigenous women. When Helen Joe and her sister, Monica Jones, were younger, they would pay frequent visits to the police station to ask if there had been any progress on the case. A hiker eventually found Catherine Joe’s remains, which had been dumped in a rural area of Duncan. Jones helped spearhead the first annual walk in Duncan, where her sister Catherine is from. 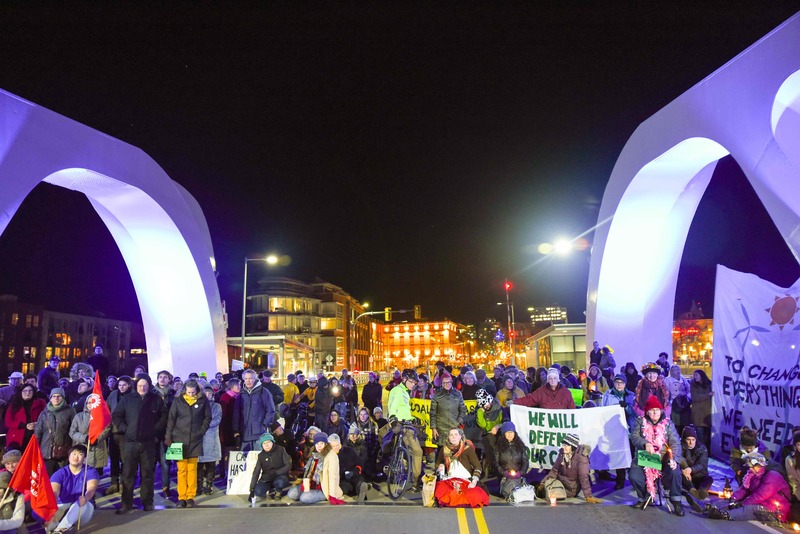 Many annual marches have sprouted up across Canada, inspired by the first memorial walk in Vancouver in 1992 after a Coast Salish woman was found murdered on Powell Street. 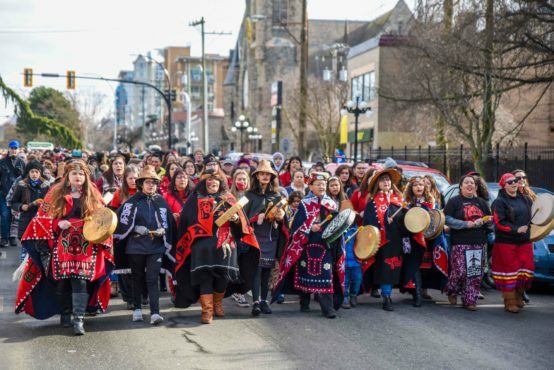 “People were recognizing that our women were disappearing on the streets of Downtown Eastside [Vancouver] in disproportionate numbers,” says Nancy Kinyewakan of the Sioux Valley and Peguis First Nations and a lead organizer of this year’s march in Victoria. Left to right: Monica Jones, Sylvia Alphonse, Mardina Page, Helen Joe, and Dwayne Joe honour their family member Catherine Joe. 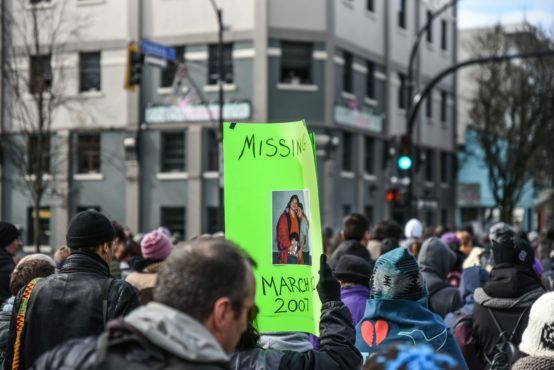 Victoria followed with its own march 12 years ago, and for many here in Victoria, the day has come to include missing and murdered men and boys as well. Elizabeth Louie, also a member of Cowichan Tribes and a relative of the Joe family, is the mother of Desmond Peter, who went missing at age 14 in Duncan in 2007. “When my son went missing, [I was] like, ‘Wow it’s not only happening to women, it’s happening to young men — our men,’” says Louie. Louie says the solidarity of the Stolen Sisters march has helped her build up the strength to bring Desmond’s story to the world. Phyllis Henry, also related to Louie and the Joe family, was another mother at the march who lost her son, Ian Henry. He has been missing for about four years, leaving behind his two brothers and one sister, as well as three nephews, a niece, and the rest of his family. As usual, this year’s march culminated at the B.C. 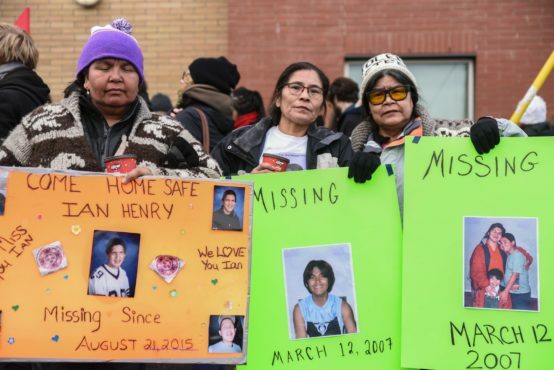 Legislature, where a series of speakers spoke about their personal experiences, while others speculated on root causes for the high rates of missing and murdered in First Nation communities. Kinyewakan says that the roots of the issue need to be tackled from many angles. “We need to make change within the systems in our society — the justice system, the education system, the child welfare system, the foster care system — because almost all of us are survivors as Indigenous women,” she says. Kinyewakan points to another root cause — a conceptual one. 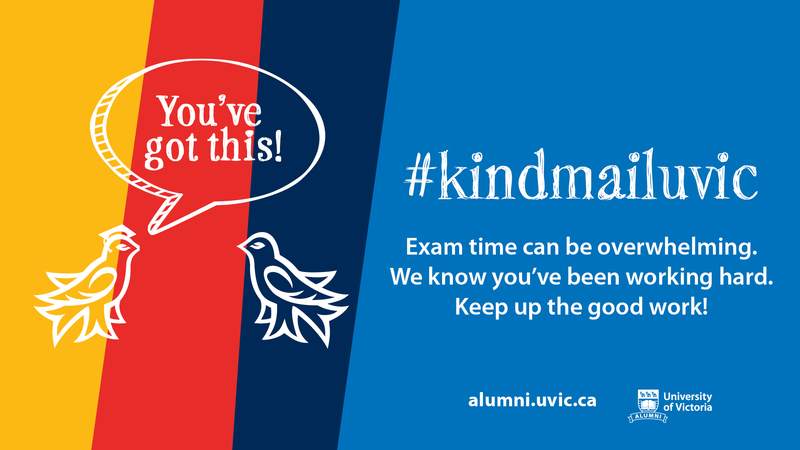 Val Napoleon, UVic Law Foundation Professor of Aboriginal Justice and Governance, echoes Kinyewakan’s sentiment. Napoleon adds that the absence of law are at the root of the problem, too. Napoleon says these lawless spaces are created in two ways: through the undermining of Indigenous legal orders, and through the failure of Canadian law. “The essential work of today, for all of us, is to rebuild Indigenous law so that we can create safe and inclusive communities and to deal with problems as they arise,” she says. An independent National Inquiry was started in 2016, and Feb. 22, 2019 was the final day for the public to submit documents for consideration. 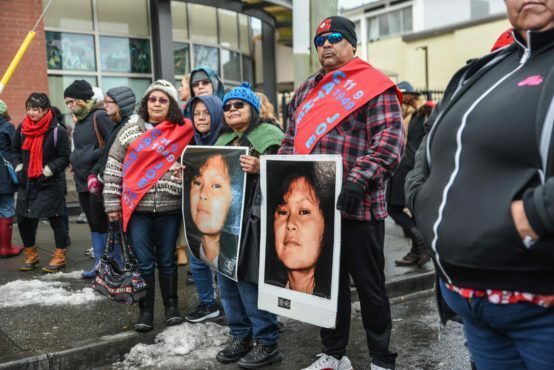 After gathering evidence, the inquiry will examine underlying factors and patterns of missing and murdered cases to look into the systemic causes of violence faced disproportionately by Indigenous women, children and 2SLGBTQQIA individuals in Canada. Meanwhile, Indigenous families continue to come out each year to march for their lost loved ones. “I know it takes a lot of courage for the family members to come out today and show your pictures of the ones who have been lost,” Kinyewakan says to those gathered at the Legislature.